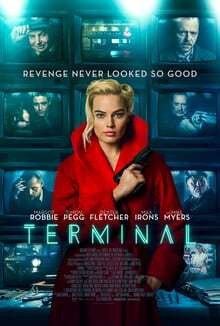 Starring Margot Robbie, Simon Pegg, Mike Myers, Dexter Fletcher, Max Irons, and Thomas Turgoose. Anybody who travels by train won’t be able to resist a wry smile at the setting of Terminal. An empty railway station. Not a soul in sight, apart from the limping night supervisor and a passenger with a bad cough, who wants to know when the next train is. Not until 4.40 am, comes the answer, so hours away. More familiar than the lack of passengers, that’s for sure. Not that Vaughn Stein’s debut feature is seeking to highlight the plight of fraught commuters. What he’s aiming for is a visually stylish piece of neo-noir set in the future, one that takes its inspiration from the curious combination of the 50s and Lewis Carroll. For the majority of the film, there’s two parallel narratives. One revolves around hitmen Dexter Fletcher and an unusually un-posh Max Irons, whose working relationship is on an increasingly acrimonious slide as they wait in a hotel room for the go-ahead for their next job. 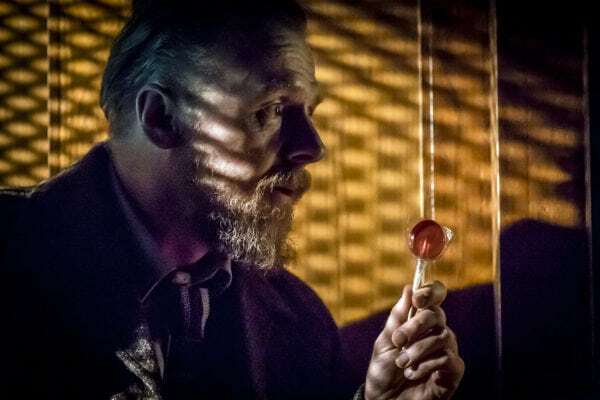 The other takes place in the terminal of the title, where ailing schoolteacher Simon Pegg knows his days are numbered and is contemplating doing away with himself. He goes to the station café, appropriately named The End Of The Line, to think it over some more and finds himself keeping company with Margot Robbie’s glamorous waitress. Someone with a few ideas on how he can put an end to his misery. Set in the future it may be, but the look is very much of the 50s, with all those neon lights disguising shabby, down at heel buildings and creating a sense of glamour that’s entirely artificial. The station café mimics an American diner of the period, but it serves very British sticky buns, and the design follows through into Robbie’s clothes and make up – a well-fitting, full skirted coat, seamed stockings and fulsome red lips. By comparison, the men are non-descript, both visually and in their characters as well, with Robbie holding the reins, connecting the two narratives and bringing them together for the inevitable conclusion. She also introduces the Lewis Carroll, specifically Alice In Wonderland, thread running through the movie, with her opening voiceover. She’s in a world where “you need to be mad as a hatter” to survive, where the local lap dancing club is La Lapine Blanche and, when the hitmen are presented with their instructions, they come in a briefcase complete with the label “Open Me.” But, if Robbie is meant to be Alice, she’s a long way from it and the whole metaphor feels strained, ultimately disappearing down a black hole. She’s after revenge and one of her targets ends up there as well. More concerned with appearance than much else, Terminal tries to re-create the look of Vegas, but on a budget allocation of neon lights that calls to mind something closer to a tacky British seaside resort. 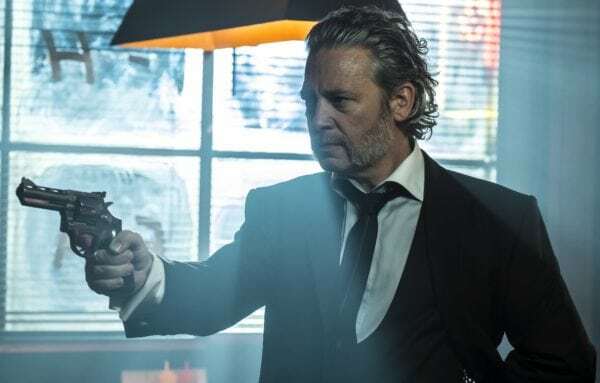 There’s a touch of Sin City about it all, except that neither story nor script are on the same level and the visuals are the only thing strong enough to carry it through to the disappointing and predictable end, when the whole thing goes completely off the rails. As for the title, is it the final stopping place for trains or just the end? You choose.